You'd think if you were sitting on a Geo Metro made into a 12-foot limo, you'd have your LeMons racing plan pretty well wrapped up. Of course, if you said that, you wouldn't be noted LeMons loon Speedycop and his Gang of Outlaws. See, even though Jeff Bloch (the racing police officer who goes by SpeedyCop) has a perfectly insane LeMons car and more LeMons trophies and boxes of nickels than one can comfortably agitate a stick at, he had a dream. A dream to make the world's first road-racing airplane. And he's started doing it. This is the kind of racing that can only happen at the 24 Hours of LeMons, a play on the famous French race that pits beater cars purchased for $500 or less against one another. The winner of the 24-hour endurance race isn't really the person who gets the most laps, but the most batshit design. Like a Stair Car Honda Civic. I asked Speedycop if he happened to see a scrapped plane and get the idea from that, but he told me the raceable plane idea came first. He'd just come off racing a pop-top camper and wanted something to top that. No one had taken an aircraft and turned it into a LeMons car yet, Jeff realized, and apparently, that's all it takes to get the guy going. Most of us have ideas like that, then we finish our shower and get on with our normal day. Speedycop goes plane hunting. Finding a suitable donor plane is surprisingly tricky. "Two to three thousand only gets you a a wrecked single-engine Cessna missing the front cowl," Jeff explained. Most of the planes even remotely in a normal price range were useless. Then, by chance and a mere five miles from his house, Jeff found a '56 Cessna 310. These were twin-engine planes, not even all that small, common for air taxis and similar roles in the 60s to the 80s. The one Jeff found was in remarkably good shape, fuselage-wise. No engines or tail, but the main body of the plane was intact— the controls and instruments were even largely in place! A bit of internet research revealed the plane had been belly landed at least once, and had landing failure on another occasion before being retired. Two grand later, it's his. Oh, and lots of bribes and special waiving of rules to allow the higher cost for the LeMons race because, come on, it's a freaking plane. The donor chassis/drivetrain for the car seems like a very promising combination: mid-engined, rear-drive, race-bred 1987 Toyota VanWagon. The van's body will be entirely removed, and the chassis will be narrowed down to about 50 inches, tapering at the rear to match the shape of the plane. The goal is to make something that "looks as much like a plane taxiing on the racetrack as possible," according to Jeff. The video in the post has some good shots of the van getting stripped down by the whole dedicated team of bold loons. Jeff also told me that thanks to the VanWagon's very uneven weight distribution, "stoppies" (rear wheel wheelies) under hard braking are possible, giving lots of opportunities for "crash landing photos." Oh boy. Even better, the current plan is to leave all the instruments in place, and to attempt to use the plane's yoke to steer the car, possibly by using actuators to move the steering rack, since the yoke doesn't really spin like a wheel. It's a bit early to tell, but they're not ruling anything out yet. Like wings. The plan now is for 16-18" winglets, to at least feel plane-like without, you know, killing everyone, and rear-view cameras are planned to avoid having to use mirrors that would spoil the plane-in-peril illusion. Jeff's big question now is what could he possibly do next? 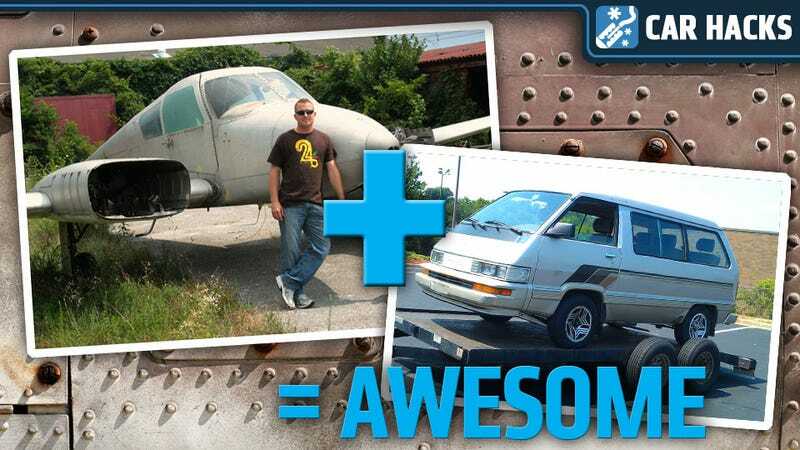 After making an airplane-based LeMons car, where do you go? I suggested space capsule. I know they used boilerplate capsules for all kinds of testing— I bet someone has one of those things rusting in a field somewhere. A Gemini would be pretty sweet— it looks like they made seven test capsules! Better get on that, Speedycop.